W e l c o m e t o m y f i r s t g i v e a w a y ! ! Yesterday, I mentioned I was working on something. 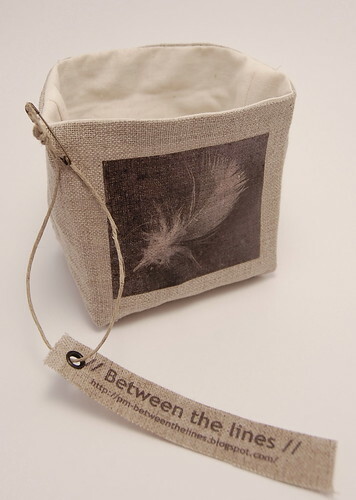 But lets get back to the order of the day: this feather basket could be yours! How? Just leave a comment to this post. Deadline for this giveaway is Sunday March, 15th 12:00 pm CET. The winner will be announced on Monday, March 16th. A couple more details maybe: the basket measures 9cm x 6.5cm x 8cm and is made out of natural colored linen, and lined with cotton. The picture is iron-on-transferred. So, leave a comment and good luck!! Remark: No need to leave your address here. I will contact the winner to collect the details!